..... Click the link for more information. ) and inversely proportional to the square of the distance between them. The constant of proportionality in this law is known as the gravitational constant; it is usually represented by the symbol G and has the value 6.670 × 10−11 N-m2/kg2 in the meter-kilogram-second (mks) system of units. Very accurate early measurements of the value of G were made by Henry Cavendish. ..... Click the link for more information. explained these differences and provided a geometric explanation for gravitational phenomena, holding that matter causes a curvature of the space-time framework in its immediate neighborhood. ..... Click the link for more information. merger. Begun by French and Italian scientific research organizations and now including personnel from institutes in other European nations, Virgo has a design similar to LIGO's, with two arms 1.86 mi (3 km) long. The proposed, even more ambitious Laser Interferometer Space Antenna (LISA) was originally a NASA–European Space Agency project but NASA withdrew in 2011 due to a lack of funding. ..... Click the link for more information. due to gravity, symbolized as g, provides a convenient measure of the strength of the earth's gravitational field at different locations. The value of g varies from about 9.832 meters per second per second (m/sec2) at the poles to about 9.780 m/sec2 at the equator. Its value generally decreases with increasing altitude. Because variations in the value of g are not large, for ordinary calculations a value of 9.8 m/sec2, or 32 ft/sec2, is commonly used. See A. S. Eddington, Space, Time and Gravitation (1920); J. A. Wheeler, A Journey into Gravity and Spacetime (1990); M. Bartusiak, Einstein's Unfinished Symphony: Listening to the Sounds of Space-Time (2000). The mutual attraction between all masses and particles of matter in the universe. In a sense this is one of the best-known physical phenomena. During the eighteenth and nineteenth centuries gravitational astronomy, based on Newton's laws, attracted many of the leading mathematicians and was brought to such a pitch that it seemed that only extra numerical refinements would be needed in order to account in detail for the motions of all celestial bodies. In the twentieth century, however, A. Einstein shattered this complacency, and the subject is currently in a healthy state of flux. where G is called the constant of gravitation. In 1774, G was determined by measuring the deflection of the vertical by the attraction of a mountain. This method is much inferior to the laboratory method in which the gravitational force between known masses is measured. 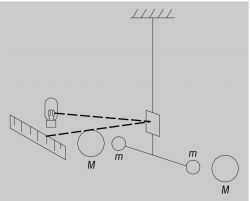 In the torsion balance two small spheres, each of mass m, are connected by a light rod, suspended in the middle by a thin wire. The deflection caused by bringing two large spheres each of mass M near the small ones on opposite sides of the rod is measured, and the force is evaluated by observing the period of oscillation of the rod under the influence of the torsion of the wire (see illustration). This is known as the Cavendish experiment, in honor of H. Cavendish, who achieved the first reliable results by this method in 1797–1798. More recent determinations using various refinements yield the results: constant of gravitation G = 6.67 × 10-11 SI (mks) units; mass of Earth = 5.98 × 1024 kg. The result of the best available laboratory measurements, announced in 2002, is G = (6.6742 ± 0.0010) × 10-11 in SI (mks) units. In newtonian gravitation, G is an absolute constant, independent of time, place, and the chemical composition of the masses involved. Partial confirmation of this was provided before Newton's time by the experiment attributed to Galileo in which different weights released simultaneously from the top of the Tower of Pisa reached the ground at the same time. Newton found further confirmation, experimenting with pendulums made out of different materials. Early in this century, R. Eötvös found that different materials fall with the same acceleration to within 1 part in 107. The accuracy of this figure has been extended to 1 part in 1011, using aluminum and gold, and to 0.9 × 10-12 with a confidence of 95%, using aluminum and platinum. In the equations of motion of newtonian mechanics, the mass of a body appears as inertial mass, a measure of resistance to acceleration, and as gravitational mass in the expression of the gravitational force. The equality of these masses is confirmed by the Eötvös experiment. It justifies the assumption that the motion of a particle in a gravitational field does not depend on its physical composition. In Newton's theory the equality can be said to be a coincidence, but not in Einstein's theory, where this equivalence becomes a cornerstone of relativistic gravitation. This should not be confused with the term gravitation. Gravity is the older term, meaning the quality of having weight, and so came to be applied to the tendency of downward motion on the Earth. Gravity or the force of gravity is today used to describe the intensity of gravitational forces, usually on the surface of the Earth or another celestial body. So gravitation refers to a universal phenomenon, while gravity refers to its local manifestation. Light is deflected when it passes through a gravitational field, and an analogy can be made to the refraction of light passing through a lens. It has been suggested that a galaxy situated between an observer and a more distant source might have a focusing effect, and that this might account for some of the observed properties of quasistellar objects. The multiple images of the quasar (Q0957 + 561 A,B) are almost certainly caused by the light from a single body passing through a gravitational lens. While this is the best-studied gravitational lens, many other examples of this phenomenon have been discovered. In spite of his success and the absence of a reasonable alternative, Newton's theory was heavily criticized, not least with regard to its requirement of “action at a distance” (that is, through a vacuum). Newton himself considered this to be “an absurdity,” and he recognized the weaknesses in postulating in his system of mechanics the existence of preferred reference systems (that is, inertial reference systems) and an absolute time. The theory of relativity grew from attempts to describe electromagnetic phenomena in moving systems. No physical effect can propagate with a speed exceeding that of light in vacuum; therefore, Newton's theory must be the limiting case of a field theory in which the speed of propagation approaches infinity. Einstein's field theory of gravitation (general relativity) is based on the identification of the gravitational field with the curvature of space-time. The geometry of space-time is affected by the presence of matter and radiation. The relationship between mass-energy and the space-time curvature is therefore a relativistic generalization of the newtonian law of gravitation. The relativistic theory is mathematically far more complicated than Newton's. Instead of the single newtonian potential described above, Einstein worked with 10 quantities that form a tensor. The existence of gravitational waves, or gravitational “radiation,” was predicted by Einstein shortly after he formulated his general theory of relativity. They are now a feature of any relativity theory. Gravitational waves are “ripples in the curvature of space-time.” In other words, they are propagating gravitational fields, or propagating patterns of strain, traveling at the speed of light. They carry energy and can exert forces on matter in their path, producing, for instance, very small vibrations in elastic bodies. The gravitational wave is produced by change in the distribution of some matter. It is not produced by a rotating sphere, but would result from a rotating body not having symmetry about its axis of rotation: a pulsar, perhaps. In spite of the relatively weak interaction between gravitational radiation and matter, the measurement of this radiation is now technically possible. The constant of proportionality, G , is the gravitational constant. The force experienced by the mass m 1 is equal to but in the opposite direction to that felt by the mass m 2 : the two masses are attracted toward each other. Newton showed that any body behaves, gravitationally, as if its mass were concentrated at its center. Thus gravitational force acts along a line joining the center of two bodies. In a system in equilibrium, such as the Solar System or a star like the Sun, gravitational force is balanced by an equal force acting in the opposite direction. The region of space surrounding a massive body and in which the gravitational force is appreciable is the gravitational field of that body. The magnitude of the field at a particular point is the gravitational acceleration (in the direction of the massive body) that would be experienced by any object at that point; this is equivalent to the force that would be experienced by an object of unit mass at that point. A gravitational field depends on the distribution of matter that causes it. Its effect is on another distribution of matter. The gravitational potential at a point in a gravitational field is the work done in bringing unit mass to this point from a point infinitely distant from the cause of the field; it is thus the potential energy of a particle of unit mass arising from the mass of a material body. Gravitation is the weakest force known. It is many orders of magnitude smaller than the other fundamental forces of nature – the strong, electromagnetic, and weak interactions. It is, however, the only means by which bodies can interact over immense distances. Newton's theory of gravitation has proved adequate in most circumstances but was challenged by the more complex general theory of relativity put forward by Albert Einstein in 1915. According to general relativity, gravitational fields change the geometry of spacetime: both space and time are curved or warped around a massive body. Matter tells spacetime how to curve and spacetime tells matter how to move. See also Kepler's laws; quantum gravitation. (or gravitational interaction), a universal interaction involving all matter. If the interaction is relatively weak and the bodies in question are moving slowly relative to the speed of light, then Newton’s law of universal gravitation holds. In the general case gravitation is described by A. Einstein’s general theory of relativity, which views gravitation as the action of matter on properties of space and time; the properties of space-time in turn exert an influence on the motion of bodies and on other physical processes. Thus, the modern theory of gravitation differs markedly from the theory of the three other basic interactions—the electromagnetic, strong, and weak interactions. In 16th- and 17th-century Europe new attempts were made to prove the existence of the mutual attraction of bodies. J. Kepler, the founder of theoretical astronomy, wrote that “gravity is a mutual bodily affection between allied bodies tending toward their union or junction.” The Italian physicist G. Borelli used the notion of attraction to explain the motion of the satellites of Jupiter around their primary. By “particles” here are meant any bodies such that their linear dimensions are much less than the distance between the bodies. The proportionality constant G is called the constant of gravitation, or gravitational constant. The first measurement of G was made in 1798 by the English physicist H. Cavendish, who used a torsion balance to determine the forces of attraction between spherical masses. According to the most recent data, G = (6.673 ± 0.003) × 10–8 cm3/g-sec2. It should be noted that the degree of accuracy to which G has been determined is much less than the accuracy that has been attained in the verification of the law of gravitation as expressed in equation (1) (that is, direct proportionality of the force to the masses and indirect proportionality to the square of the distance). According to equation (1), the gravitational force depends only on the position of the particles at a given instant. In other words, the gravitational interaction propagates instantaneously. Another important characteristic of Newton’s law of gravitation is that the gravitational force with which a given body A attracts another body B is proportional to the mass of body B. According to Newton’s second law of motion, however, the acceleration that B undergoes is inversely proportional to B’s mass. Consequently, the acceleration of B owing to the attraction of A is independent of the mass of B. Such acceleration is called free-fall acceleration. In order to calculate the gravitational force exerted on a given particle by many other particles, the vector sum of the individual forces exerted by the particles must be found; to determine the gravitational force produced by a continuous distribution of mass in some region of space, integration must be carried out. Thus, in Newton’s theory of gravity the superposition principle is valid. Newton proved theoretically that the gravitational force between two spheres of finite dimensions with a spherically symmetric distribution of mass is also expressed by equation (1). In this case mA and mB are the total masses of the spheres, and r is the distance between the spheres’ centers. In the case of an arbitrary mass distribution, the gravitational force acting on a particle at a given point can be expressed as the product of the mass of the particle and the vector g, which is called the gravitational field strength at the given point. The larger the absolute value of g, the stronger the gravitational field. Here, integration is carried out over the entire mass of the body or system of bodies, and r is the distance of an element of mass dm from the point at which the potential is calculated. Expression (4a) is a solution of the Poisson equation (4). The potential of an isolated body or system of bodies is generally defined non-uniquely. For example, an arbitrary constant may be added to the potential. If it is stipulated that at an infinite distance from the body or system the potential is zero, then the potential is defined unambiguously by the solution of the Poisson equation in the form of (4a). The Newtonian theory of gravitation and Newtonian mechanics were a great achievement of natural science. They made it possible to describe with high accuracy a broad range of phenomena, including the motion of natural and artificial bodies in the solar system and motions in such other systems of celestial bodies as binary stars, star clusters, and galaxies. The existence of the previously unknown planet Neptune and of the companion of Sirius was predicted on the basis of Newton’s theory of gravitation. The theory made possible a number of other predictions as well that were subsequently confirmed. In modern astronomy Newton’s law of gravitation is made use of in determining the masses of celestial bodies and in calculating the bodies’ motions, structure, and evolution. The precise determination of the earth’s gravitational field permits establishment of the mass distribution below the surface (gravimetric surveying) and consequently makes possible the direct solution of important practical problems. Newton’s law fails to explain gravitation adequately, however, in the case of sufficiently strong gravitational fields in which bodies move at rates that are not small compared with the speed of light. In the gravitational fields of ordinary celestial bodies this condition is fulfilled; for example, ǀφǀC2 is approximately 4 × 10–6 on the surface of the sun and is of the order of 10–3 on the surface of white dwarfs. Furthermore, Newton’s theory is inapplicable to the calculation of the motion of particles even in a weak gravitational field that satisfies condition (5) if the particles passing near a massive body already had, when they were still far from the body, a speed comparable to the speed of light. In particular, Newton’s theory cannot be used to calculate the trajectory of light in a gravitational field. Finally, Newton’s theory cannot be applied in calculations of a variable gravitational field generated by moving bodies, such as binary stars, at distances r > λ = cτ, where τ is the characteristic time of motion in the system, for example, the period of revolution in the case of a binary star system. According to Newton’s theory, the gravitational field at any distance from the system is defined by equation (4a), that is, by the positions of the masses at the instant at which the field is defined. This circumstance means that when bodies move in the system, the changes in the gravitational field that are due to the motion of the bodies are communicated instantaneously over any distance r. According to the special theory of relativity, however, a change occurring in the field in the time τ cannot propagate at a speed greater than c.
Einstein generalized the theory of gravitation on the basis of the special theory of relativity in 1915 and 1916. He called the new theory the general theory of relativity. where a is the acceleration of the body under the action of the gravitational field strength g. If miner is proportional to mgrav and the proportionality constant is the same for all bodies, then the units of measurement can be selected so that the constant is equal to unity—that is, so that miner = mgrav. The quantities miner and jgrav can then be canceled out in equation (6). We thereby obtain the result that the acceleration a is independent of the mass and is equal to the gravitational field strength g: a = g, in accordance with Galileo’s finding. Thus, if their initial velocities are the same, bodies of different mass and nature move in a given gravitational field in a completely identical way. This fact indicates that the motion of bodies in a gravitational field is very much like the motion of bodies that occurs in the absence of a gravitational field but relative to an accelerated frame of reference. Consider, for example, bodies moving in the absence of a gravitational field. They move by inertia in a straight line and at a constant speed. If the bodies are observed from the cabin of a spaceship that is not in a gravitational field and is moving with a constant acceleration owing to the work performed by the ship’s engine, then the bodies all move with respect to the cabin with a constant acceleration equal in magnitude and opposite in direction to the acceleration of the ship. The bodies move in the same way they would if they were falling with this acceleration in a constant uniform gravitational field. The inertial forces acting in a spaceship flying with an acceleration equal to that of free fall at the earth’s surface are indistinguishable from the gravitational forces acting in the true gravitational field in a ship standing on the earth’s surface. Consequently, the inertial forces in the accelerated frame of reference associated with the spaceship are equivalent to a gravitational field. This fact is expressed by Einstein’s principle of equivalence, or equivalence principle. In accordance with the principle of equivalence, the described imitation of a gravitational field by an accelerated frame of reference can be reversed. In other words, the true gravitational field at a given point can be “destroyed” by introducing a frame of reference that moves with free-fall acceleration. It is well known that a state of weightlessness—that is, a state where gravitational forces are not manifested—occurs in the cabin of a spaceship that is moving freely (with its engines shut off) around the earth in the earth’s gravitational field. Einstein hypothesized that not only mechanical motion but all physical processes obey the same laws in a true gravitational field and in an accelerated frame of reference in the absence of a gravitational field. This principle has been called the strong principle of equivalence, in contrast to the weak principle of equivalence, which pertains only to the laws of mechanics. Fundamental concepts of Einstein’s theory of gravitation. The frame of reference considered above (a spaceship with its engine operating), which moves with a constant acceleration in the absence of a gravitational field, imitates only a uniform gravitational field that is of constant magnitude and direction throughout all space. The gravitational fields generated by individual bodies, however, are not of this kind. The imitation of the earth’s spherical gravitational field, for example, requires accelerated frames of reference with acceleration in different directions at different points. If observers in the different frames of reference were to communicate with each other, they would find that they were moving under acceleration relative to each other and would thereby establish the absence of a true gravitational field. Thus, a true gravitational field cannot be reduced simply to the introduction of an accelerated frame of reference in ordinary space or, more accurately, in the space-time of the special theory of relativity. Einstein showed, however, that if it is required, on the basis of the principle of equivalence, that a true gravitational field be equivalent to local frames of reference that are appropriately accelerated at every point, then in any finite region space-time must be curved, that is, non-Euclidean. This circumstance means that the geometry of three-dimensional space is in general non-Euclidean (the sum of the angles of a triangle does not equal π, the ratio of the circumference to the radius of a circle does not equal 2π, and so on) and that time flows differently at different points. Thus, according to Einstein’s theory of gravitation, a true gravitational field is a manifestation of the curvature—that is, the difference in the geometry from the Euclidean case—of four-dimensional space-time. It should be emphasized that Einstein’s theory of gravitation became possible only after the discovery of non-Euclidean geometry by the Russian mathematician N. I. Lobachevskii, the Hungarian mathematician J. Bolyai, and the German mathematicians K. Gauss and B. Riemann. In the absence of a gravitational field, the inertial motion of a body in the space-time of the special theory of relativity is represented by a straight line, or what is called in mathematics a geodesic. On the basis of the principle of equivalence Einstein put forth an important concept that constitutes the foundation of gravitational theory. The concept consists in the following: in a gravitational field all bodies move along geodesies in space-time; since, however, space-time is curved, the geodesies are not straight lines. The masses producing a gravitational field curve space-time. A body’s mass or composition does not affect the geodesic along which the body moves in curved space-time. An observer perceives this motion as motion along a curved trajectory in three-dimensional space with a variable speed. It is fundamental to Einstein’s theory that the curvature of the trajectory and the law governing the change in speed are properties of space-time, that is, of the geodesies in space-time. Consequently, the acceleration of different bodies should be the same. This result means that the ratio of the gravitational mass to the inertial mass is the same for all bodies [as equation (6) indicates, the acceleration of a body in a given gravitational field depends on this ratio]: these masses are indistinguishable. Thus, according to Einstein, a gravitational field is the deviation of the properties of space-time from the properties of the flat, or uncurved, manifold of the special theory of relativity. The second important concept underlying Einstein’s theory is that gravitation, that is, the curvature of space-time, is determined not only by the mass of the matter making up a body but also by all the forms of energy present in the system. This idea generalizes to the case of gravitational theory the special theory of relativity’s principle of the equivalence of mass and energy (E = mc2, where E is energy and m is mass). Consequently, gravitation depends not only on the distribution of masses in space but also on the motion of the masses, on the pressure and stresses in the bodies, and on the electromagnetic and other physical fields. Finally, Einstein’s theory of gravitation generalizes the conclusion of the special theory of relativity regarding the finite rate of propagation of all types of interactions. According to Einstein, changes in a gravitational field propagate in a vacuum at the speed c.
where t is the time and x, y, and z are the rectangular Cartesian space coordinates. Such a coordinate system is called Galilean. Expression (7) is similar in form to the expression for the square of distance in Euclidean three-dimensional space in Cartesian coordinates (the expressions differ in the number of dimensions and in the signs standing before the squares of the differentials on the right-hand side). The space-time of the special theory of relativity is flat and may be described as quasi-Euclidean, rather than Euclidean, in order to point out the special character of time: (cdt)2 in expression (7) is preceded by a plus sign, in contrast to the minus signs in front of the squares of the differentials of the space coordinates. The special theory of relativity is a theory of physical processes in the quasi-Euclidean space-time known as Minkowski space-time (seeMINKOWSKI SPACE). Here, xl, x2, and x3, are arbitrary space coordinates, and x0 = ct is the time coordinate (here and below the repetition of an index in an expression indicates that summation is performed with respect to the index). From the physical standpoint, by adopting arbitrary coordinates we may pass from an inertial frame of reference to a frame that, in general, is undergoing acceleration (which in the general case is different at different points), deformation, and rotation; in this frame of reference non-Cartesian space coordinates are used. Despite the apparent complexity of using such frames of reference, in practice they sometimes prove convenient. In the special theory of relativity, however, Galilean coordinates, in which the interval is described particularly simply, may always be used. In equation (8) in this case gik = 0 when i ≠ k, g00 = l, and gii = –1 when i = 1,2,3. In the presence of a gravitational field the quantity g00 is different at different points; consequently, the rate of flow of time depends on the gravitational field. It can be shown that the stronger the field, the more slowly time flows in comparison with the flow of time for an observer outside the field. The tensor calculus is the mathematical apparatus used to study non-Euclidean geometry in arbitrary coordinates (seeRIEMANNIAN GEOMETRY). The general theory of relativity employs the apparatus of the tensor calculus, and the theory’s laws are written in arbitrary curvilinear coordinates (this fact means, in particular, that the laws are written for arbitrary frames of reference) in what is called covariant form. The main task of gravitational theory is to define the gravitational field. This problem corresponds in Einstein’s theory to finding the geometry of space-time, a task that reduces to finding the metric tensor gik. Here, Rik is the Ricci, or contracted curvature, tensor, which is expressed in terms of gik and its first and second derivatives with respect to the coordinates; R = Rik gik (the quantities gk are determined from the equations , where is the Kroneker delta); and Tik is the matter’s energy-momentum tensor, whose components are expressed in terms of the density, momentum fluxes, and other quantities that characterize physical matter and its motion (here, physical matter includes ordinary matter, electromagnetic fields, and all other physical fields). In 1917, not long after he had formulated the general theory of relativity, Einstein showed that equation (9) could be altered without violating the basic principles of the new theory. This alteration consists in adding to the right-hand side of equation (9) the cosmological term Λgik. The constant Λ, which is called the cosmological constant, has the dimension cm–2. The reason for this complication of the theory was that Einstein was seeking to construct a static model of the universe, that is, a model wherein the universe does not change with time (seeCOSMOLOGY). The cosmological term may be regarded as a quantity describing the energy density and pressure (or stress) of a vacuum. The Soviet mathematician A. A. Fridman (Friedman), however, showed in the 1920’s that without the cosmological term Einstein’s equations imply an evolving model of the universe. The American astronomer E. Hubble subsequently discovered, in 1929, the law of the red shift for galaxies (Hubble’s law); the red shift was interpreted as a confirmation of the evolutionary model of the universe. Einstein’s notion of a static universe thus proved to be incorrect. Although equations with the cosmological term also allow nonstatic solutions for the model of the universe, the need for the cosmological term had vanished. Einstein then reached the conclusion that it was not necessary to introduce the cosmological term into the field equations—that is, Λ = 0. Not all physicists agree with this conclusion. So far, however, no serious observational, experimental, or theoretical grounds have been advanced for considering A to be nonzero. In any case as-trophysical observations indicate that if Λ ≠ 0, its absolute value is extremely small: ǀΛǀ < 10–55 cm–2. Although it may play a role in cosmology, in practice the constant has absolutely no effect in any other problems of gravitational theory. In the remainder of the present article it will be assumed that Λ = 0. Equation (9) bears an outward similarity to equation (4) for the Newtonian potential. In both cases the quantities that characterize the field are on the left-hand side, and the quantities that characterize the matter that produces the field are on the right-hand side. Equation (9), however, has a number of important distinctive features. Equation (4) is linear and therefore satisfies the superposition principle. The gravitational potential φ can be calculated for any distribution of arbitrarily moving masses by means of this equation. The Newtonian gravitational field does not depend on the motion of the masses, and equation (4) therefore does not in itself define their motion. The motion of the masses is determined from Newton’s second law of motion [equation (6)]. The situation is different in Einstein’s theory. Equation (9) is nonlinear and does not satisfy the superposition principle. In Einstein’s theory it is not possible to specify arbitrarily the equation’s right-hand side (Tik), which depends on the motion of matter, and then calculate the gravitational field gik. The solution of Einstein’s equations leads both to the determination of the motion of the matter producing the field and to the calculation of the field. The equations of the gravitational field contain the equations of motion of the masses in the gravitational field. From the physical standpoint, the significance of this fact is that in Einstein’s theory matter is responsible for the curvature of space-time and this curvature in turn affects the motion of the matter that produces the curvature. Of course, in order to solve Einstein’s equations, characteristics of the matter that do not depend on gravitational forces must be known. For example, in the case of an ideal gas the equation of state of the substance—that is, the relation between pressure and density—must be known. In the case of weak gravitational fields, the space-time metric differs little from the Euclidean metric, and Einstein’s equations are approximately equivalent to equations (4) and (6) of Newton’s theory (if motions that are slow in comparison with the speed of light are considered and the distances from the source of the field are much smaller than λ = cτ, where λ is the characteristic time required for a change in the position of the bodies at the field source). In this case we may limit ourselves to calculating small corrections to Newton’s equations. The effects corresponding to these corrections make it possible to test Einstein’s theory experimentally (see below). The effects of Einstein’s theory are especially significant in strong gravitational fields. Some conclusions of Einstein’s theory of gravitation. A number of conclusions of Einstein’s theory differ qualitatively from those of Newtonian gravitational theory. The most important of such conclusions of the new theory are the occurrence of black holes, which are singularities of space-time (places where, according to theory, particles and fields formally cease to exist in the ordinary form known to us), and the existence of gravitational waves. Consequently, if a body of mass m contracts to a size with linear dimensions smaller than r = 2Gm/c2, which is called the gravitational radius, the gravitational field becomes so strong that even light cannot escape to a distant observer at infinity, since a velocity greater than the speed of light would be required. Such objects are called black holes. An outside observer cannot receive any information from the region inside the sphere of radius r = 2Gm/c2. Upon contraction of a rotating body, the gravitational field, according to Einstein’s theory, differs from the field of a nonrotating body, but the conclusion that a black hole is formed remains valid. If a body contracts to a size smaller than the gravitational radius, no forces can restrain the body from further contraction. The process of contraction is called gravitational collapse. When it occurs, the gravitational field intensifies—that is, the curvature of space-time increases. It has been proved that gravitational collapse inevitably leads to the appearance of a singularity of space-time. The singularity is apparently due to the warping of space-time to such an extent that its curvature becomes infinite. Theoretical astrophysics predicts the formation of black holes at the end of the evolution of massive stars (seeRELATIVISTIC ASTROPHYSICS); black holes of a different origin may also exist in the universe. Black holes appear to have been discovered in some binary star systems. GRAVITATIONAL WAVES. Einstein’s theory predicts that bodies moving under variable acceleration will emit gravitational waves. The gravitational waves are variable fields of gravitational forces and propagate at the speed of light. On striking, for example, test particles positioned perpendicular to the direction of propagation, such a wave causes periodic changes in the distance between the particles. Even in the case of gigantic systems of celestial bodies, however, the radiation of gravitational waves and the energy carried off by them are negligible. Thus, the power radiated owing to the motion of the planets of the solar system is about 1011ergs/sec, an amount that is smaller by a factor of 1022 than the radiant power of the sun. Gravitational waves interact very weakly with ordinary matter. This circumstance explains why gravitational waves have not yet been observed experimentally. Quantum effects; limits of applicability of Einstein’s theory of gravitation. Einstein’s theory is a nonquantum theory. In this regard it is similar to Maxwell’s classical electrodynamics. The most general arguments show, however, that a gravitational field must obey quantum laws in exactly the same way as an electromagnetic field. Otherwise conflicts would arise with the uncertainty principle for electrons, photons, and other particles. The application of quantum theory to gravitation shows that gravitational waves may be considered a flux of quanta, called gravitons, that are just as real as photons, the quanta of an electromagnetic field. Gravitons are neutral particles with zero rest mass and a spin of 2 (in units of Planck’s constant ћ). In the overwhelming majority of conceivable processes in the universe and in laboratory experiments, the quantum effects of gravitation are extremely weak, and Einstein’s theory may be used. Quantum effects should become considerable, however, near gravitational field singularities, where the curvature of space-time is very great. A useful quantity for describing the curvature of space-time is the radius of curvature; it is the distance at which significant deviations from Euclidean geometry are exhibited: the smaller the radius, the greater the curvature. Dimensional analysis indicates that quantum effects in gravitation become decisive when the radius of curvature of space-time becomes equal to the Planck length . The Planck length is very small: rPI = 10–33 cm. Under such conditions Einstein’s theory of gravitation is inapplicable. Singularities arise in the course of gravitational collapse. The expanding universe may be regarded as having originated in a singular state (seeCOSMOLOGY). A consistent quantum theory of gravitation applicable to singularities has not yet been developed. Quantum effects lead to the production of particles in the gravitational fields of black holes. For black holes that arise from stars and have a mass comparable to that of the sun, these effects are negligibly small. The effects may be important, however, for black holes of small mass (less than 1015 g), which in principle could have arisen in the early stages of expansion of the universe. Experimental verification of Einstein’s theory. Einstein’s theory of gravitation is based on the principle of equivalence. The verification of the principle to the highest possible accuracy is an important experimental task. According to the principle of equivalence, all bodies, regardless of composition and mass, and all types of matter must fall in a gravitational field with the same acceleration. As stated above, the validity of this assertion was first established by Galileo. The Hungarian R. von Eötvös, using a torsion balance, confirmed the principle of equivalence to an accuracy of 10”8. The American physicist R. Dicke and co-workers improved the accuracy to 10–10, and the Soviet physicist V. B. Braginskii and co-workers achieved a further improvement to 10–12. Laboratory experiments have confirmed this formula to an accuracy of at least 1 percent (seeMÖSSBAUER EFFECT). In addition to these experiments for testing the foundations of the theory, a number of experimental tests of its conclusions have been carried out. The theory predicts that when a light ray passes near a large mass, the ray will be bent. A similar deflection follows from Newtonian gravitational theory, but Einstein’s theory predicts twice as large an effect. Numerous observations have been made of this effect during total solar eclipses for the case of light from stars that passes near the sun. Einstein’s theory predicts a deflection of 1.75” at the limb of the solar disk. The observations have confirmed the prediction to an accuracy of about 20 percent. Much higher accuracy has been achieved by means of advanced equipment for observing extraterrestrial point radio sources. As of 1974, this method had confirmed the theory’s prediction to an accuracy of at least 6 percent. An effect closely associated with the bending of rays is that the speed of propagation of light in a gravitational field appears slower than is indicated by the equations that do not allow for the effects of Einstein’s theory. For a ray passing near the sun the additional time delay is about 2 × 10–4 sec. This part of the theory has been tested by timing the round-trip travel time for radar pulses between the earth and Mercury, Venus, or space vehicles passing behind the sun. As of 1974, the theory’s predictions had been confirmed to an accuracy of 2 percent. Another effect predicted by Einstein’s theory is that the elliptical orbits of the planets about the sun will turn at a rate greater than that predicted by Newtonian theory on the basis of gravitational perturbations caused by the other planets of the solar system. This effect is greatest in the case of Mercury, whose perihelion should advance 43” per century faster than is predicted by Newtonian theory. This prediction has been confirmed experimentally to an accuracy of about 1 percent. Thus, all available experimental data confirm the correctness of both the underlying principles of Einstein’s theory of gravitation and the theory’s observational predictions. Moreover, experiment has not provided support for gravitational theories differing from Einstein’s. Finally, it should be noted that the observed expansion of the universe, which was predicted theoretically on the basis of the general theory of relativity by Fridman in the mid-1920s, constitutes an indirect confirmation of Einstein’s theory of gravitation. Einstein, A. Sobr. nauchnykh trudov, vols. 1–4. Moscow, 1965–67. Landau, L., and E. Lifshits. Teoriiapolia, 6thed. Moscow, 1973. Fok, V. A. Teoríia prostranstva, vremeni i tiagoteniia, 2nd ed. Moscow, 1961. Brumberg, V. A. Reliativistskaia nebesnaia mekhanika. Moscow, 1972. Braginskii, V. B., and V. N. Rudenko. “Reliativistskie gravitatsionnye eksperimenty.” Uspekhi fizicheskikh nauk, 1970, vol. 100, issue 3, p. 395. The mutual attraction between all masses in the universe. Also known as gravitational attraction. Contrary to the standard PSO algorithm, where learning coefficients are chosen by the end user, in our case learning coefficients are computed by using gravitational interactions between particles. MM] represents Newton's law for the gravitational interaction between two masses. 1 requires the use of a two-function coalescence, and implies the involvement of two different physical phenomena, whereby the quadratic is typically associated with gravitational interactions but the Agnesi function is not. In Kozai's mechanism, gravitational interactions drive the planet's orbit toward the companion star's orbital plane, while at the same time, to compensate, the planet's orbital eccentricity is forced to increase. The gravitational interaction is not included explicitly in the SM gauge group. Presumably, it is the gravitational interaction between the free neutron and all other masses in the aether space, by enduring energy exchange with the radiant energy of the aether, that makes the neutron unstable by emitting more energy to the aether field than is absorbed in the same interval of time. Even at its closest approach to the sun, the approximately 400-km-wide ball of ice comes no closer than 14 AU to Neptune, the nearest known candidate for a significant gravitational interaction. Because waves of the field of gravitational inertial force transfer gravitational interaction, this wave speed is the speed of gravitation as well. One notion is that an elliptical orbit arises from the gravitational interaction of two giant planets that initially lie near each other but far from their parent star. Initially, gravitational interactions between the black holes and surrounding material do the trick; eventually, when the black holes are within spitting distance, they'll emit gravitational waves that drive their inward spiral. For four billion years, the rate of change of the Earth system (E) has been a complex function of astronomical (A) and geophysical (G) forces plus internal dynamics (I): Earth's orbit around the sun, gravitational interactions with other planets, the sun's heat output, colliding continents, volcanoes and evolution, among others," Gaffney added. These ripples in the curvature of spacetime are termed gravitational waves, and these are generated in certain gravitational interactions.